Scroll modal content - just by adding the class modal-dialog-scrollable you'll be able to scroll content within a modal. Horizontal lists list-group-horizontal is a new responsive class modifier that will display list groups as a horizontal row. New projects will load the latest default, yet older projects could be updated simply changing the import in the SASS panel - update it to @import 'bootstrap-4.3.1'; and changing the scripts at the bottom of your HTML pages - copy/paste them from the official Bootstrap page. Toast and modals - mobile-alike notification alert. To use them, remember to initialize them (as tooltips and popovers). For modals, a new modal-xl has been added, for even larger elements. Switch - a custom checkboxes have been enhanced with a iOS style switch. Find it in the list of form children. Check out the Bootstrap official blog to see the 4.2 ship list and get direct links to the docs for more, extensive explanation on every change. For any bug report, visit our Github repo. Monthly billing - the new Premium plan is more flexible than ever. Decide whether you want to get a monthly billing or save up to 30% by purchasing an annual license. For volume licenses or enterprises, simply contact us. Time limit - Pingendo Free is now available for using 5 days per month. When the monthly quota is reached, you will be asked to upgrade to Premium. We have dedicated plans for students, teachers and Academic Institutions: visit the educational page. Features - our core features (Visual builder, Code editor, SASS manager) are available both in Free and Premium plans. Upcoming features or building contents might be Premium only > details will be provided contextually. Pingendo has grown a lot thanks to all our Premium users. We are even more committed to make it even better and more powerful. If you are willing to see more, Go Premium! Get a live and running website in seconds, and share it with teammates and clients. A new feature, powered by Netlify. Goodbye old mockups, say hello to real working prototypes. One click - is what it really takes to see your project published. Get a unique, permanent URL, and share it with whoever you want, for a fast and effective collaboration. Always up to date - push changes is as easy as clicking a button. See your web project updated and online, in a hassle-free workflow. No old versions or conflicted copies, just live and running web pages. Set custom domain - handle your project from the Netlify dashboard and set a custom domain. Enjoy a rock-solid, world-wide known hosting service. Manage multiple websites - use the project panel for managing your pages and every web deploy you need. New Components - the component list has been enlarged and enhanced with new and ready-to-use Bootstrap components. All of them have specific setting on the right inspector, for a full customization without typing code. On canvas action - you might have notice a new toolbar just above every element in the canvas. This short menu would let you interact faster and more precisely with the selection. Clone, delete or move items, or add a child with one click: see the range of possibilities by selecting the menu icon. Margin and responsive utilities - Pingendo builder is based on Bootstrap framework and its mobile-first philosophy. As responsive settings are fundamental for creating any UI we've created a specific inspector on the right when columns are selected. Margin and padding input are also more specific and easier to set. Bug fixes - there were few glitches that have been fixed in this round. As usual we are collecting bug reports on the official Github project > go on Github. You can find the current updating situation and a brief roadmap about the next features that are going to be released. New Sections - the lists of premade blocks have been restyled and extended with more, amazing sections. Maps, assets, inline styles: there are many news, so take your time to check'em all. More prototyping interfaces will be soon introduced, for app-designer and web-delevoper happiness! CSS panel - customizing your web project is now even easier with the CSS panel and the inline style editor. Select the element you want to style and start adding backgrounds, transformations and so on. Choose a custom name for directly writing a CSS rule: then you can always inspect and modify it from the code editor (F2). Otherwise, leave selected the inline tag and it will be embedded in line in the HTML, together with the element itself. Bootstrap 4.1.3 - the latest Bootstrap version is fully supported, together with some terrific news they've introduced (eg. shadows, flex-properties, ...). Have a look to the official v4.1.3 ship list for more details. Builder interface - as you might have already noticed, the section tree on the upper right has been enhanced, giving you more control on the page structure. Moreover, you can now zoom in and out the pageview from the upper toolbar, which is a perfect feature for dragging sections easily and where you want. The code editor has also been improved with a better search function. 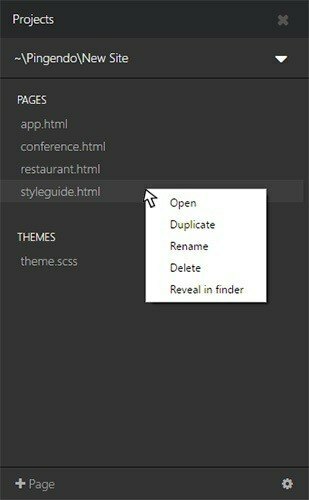 Templates - start a new project and pick a template from within the app, without needing to browse our external library. The templates have also been updated to the v4.1.3 Bootstrap version and more are coming soon. Stability - a massive developing work has been done on the software stability and many bugs have been fixed in this release. In the Help menu in app you can now access the About section, that's telling the software current version and for bug reporting via Github -> click here for issue on Github. Pingendo now features an auto-updating system, so the app will be continuously improved and updates will pop-up regularly. 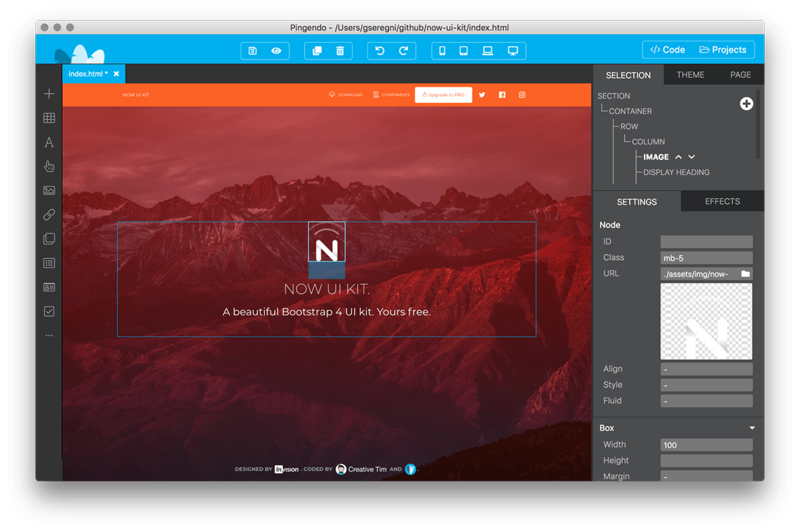 Big news on the template side: Now UI kit is available for downloading. Designed by Invision and coded by Creative Tim, it's now featured by Pingendo. Take advantages of the ready-to-use components for building fresh looking web pages. On templates.pingendo.com you'll find the link for preview and downloading. It's still a beta version as three examples pages are still under development. Refer to the Github repo for issue reports and submit your PR. Enjoy it and don't forget to share some love for Pingendo on Twitter! Floating window - like the project panel, the source editor is embedded in a different window. This allows you to resize or place it wherever you like, even on other monitors. Check your OS shortcuts for quick sizing or docking to screen borders. Design while coding, and code while designing. Navs, tabs and carousels editing has been upgraded. Now you can preview and edit all the tab contents and carousel slides in the canvas. Clicking on the nav or tab pills will switch the related tab content. For carousels you'll have to select the slide from the tree on the right. Psssst: for this video we've used the new HTML5 video snippet. Check it out in the component browser! Some news have just landed in the Template library and we are happy to share them with you! Old theme packs have been deconstructed for more download freedom. You can now get what you need in a single click, with its styleguide (plus .css and .scss files). More templates have been added to the collection: check the wireframe section, just below the themes. Prototyping could be easier and faster with these pre-made pages to start with. Last but not least, we've placed a form for whom is enjoying Pingendo to build templates. If you'd like to see your work displayed in our library, just contact us and we can do beautiful things together! One week ago the long-awaited Bootstrap 4.0 stable version has been released. It's already fully supported in Pingendo and instruction for migrating are available in this forum post already. The Project Panel has been radically improved. Quickly browse and open recent projects with the dropdown selector. Open and modify web pages by right-clicking on them and handle whole projects from the bottom menu. You can hide the panel and recalling it anytime with the Projects button in the toolbar or from the View menu. From now on, Pingendo will frame your works in projects for lowering the possibilities of "orphan" files. Keeping all the HTML pages and themes in a tidy folder will let you use the Project panel and improve your workflow. A few things have changed in Form code and some examples have been added to the left component browser. Meanwhile, we've re-organized some inspectors on the right panel for including the latest upgrades, like flex-box controls, borders and others. Have a look and enjoy the new settings. All of these updates are preparatory for a big round on ready-to-use contents. We will be working on new components, sections and templates! We have been squashing some pesky bugs thanks to users bug reports. Any communication is utterly appreciated and you can mail us anytime. Eventually, you can now get to know the team and its vision at the about link. Thanks to you and all the Pingendo community it has been an incredible quarter, and more fun is coming. Many enhancements have been recently deloyed, together with 🐛 fixes and fine tunings. No trial, no pro-tools: it's free and fully-featured. This version is meant for personal projects that will display Pingendo's logo. For commercial use and a distraction-free working experience you can choose the Premium version. Not one, but two massive upgrades to radically improve your workflow. Easy to customize, enriched with animations and tailored styleguides. A brand new Project Folder Inspector is now available in app for managing web pages. Overview your project and open pages straight from it, saving tons of time. Enjoy! A maintenance update to fix bugs and introduce small improvements all around the app (especially in breadcrumb and canvas). Don't forget you can pre-buy your license to activate Pingendo and help us to grow. Get Pingendo and support the project! Here comes the big news: Pingendo is coming to its 4th version! Beta period will end soon as we will release first stable version. You will see starting a 30-days trial. It has been a period of significant changes and more stunning updates are coming (have a look to our Roadmap). Bootstrap 4 final version is approaching and Pingendo is all set to make it work smoothly. Starting today, you can pre-buy your license to activate Pingendo and help us to grow. Thanks to the enthusiasm of our growing community, we are eager to keep improving. Pingendo now works offline so that you can still build while on the road! An update that fixes some bugs and introduces small improvements in various UI parts and snippets. Don't forget to join our Forum and let us know what features you miss or what you love more of Pingendo! Properly support resizing columns (Columns offset was removed). Restore previously open tabs on startup. We just updated Pingendo to support the – long awaited – first beta for Bootstrap 4. Read more here to learn how to update your pages that are using old Alpha release. While we approach our stable release you are encouraged to notify us about bugs and problems, using the Forum. Pingendo has been improved again: check out the left inspector for a brand new snippets browser. Scroll the ready-to-use sections on the top and drag and drop them into your webpage. More blocks and themes are coming!